This post is sponsored by BuildDirect, but all opinions are my own. I am SO excited to start showing you all of the interior shots of the house now that we are all moved in! I have to preface that by saying these rooms are not complete in the least, but I promised myself (and the Mr.) I would take my time decorating this home and not just throw a bunch of stuff up on the walls for the sake of having a finished room to share on the blog. I’m really trying to be intentional this time around and only putting things in here that I truly love. Plus, I feel the best spaces are ones that are collected over time not thrown together overnight. That said, I didn’t want to leave you hanging all summer since you have all been so great following along this whole process. My hope is it’s fun to watch this house and my style evolve, and I can share new pieces as we go along. The color is perfection. It has a really cool matte brushed finish that is perfect for the casual lake house vibe I was going for, and bonus, it hides dirt like insanely well. Seriously, I have only swept once this week, and I used to have to do it twice a day with our old darker floors. It also feels great on your feet; it’s so funny every person who has come in to see the house comments on how nice it feels! When they first installed it, I may have laid down and hugged it I was so excited to finally see it down, and it was just so much better than I thought. You can find your own here at BuildDirect and it’s at a great price point too. Remember BuildDirect will send you free samples right to your house, so you can check out how it will look risk free. Let’s get to the rest of the details – we found this table at a local furniture store it was the perfect rustic look I was looking for and 7 ft long so it can seat 8. I haven’t figured out if I want to add two more of the same chairs to the end or find different end chairs. I love the clean lines of these chairs I chose. I debated for weeks over what style to go with, but these won out in the end. It’s hard to tell in these photos but they are a really pretty soft grey color, which coordinates with my grey pantry door in the kitchen (you can kind of see it in the background of this pic, but kitchen photos coming soon!). You may remember these herb baskets from our last house. 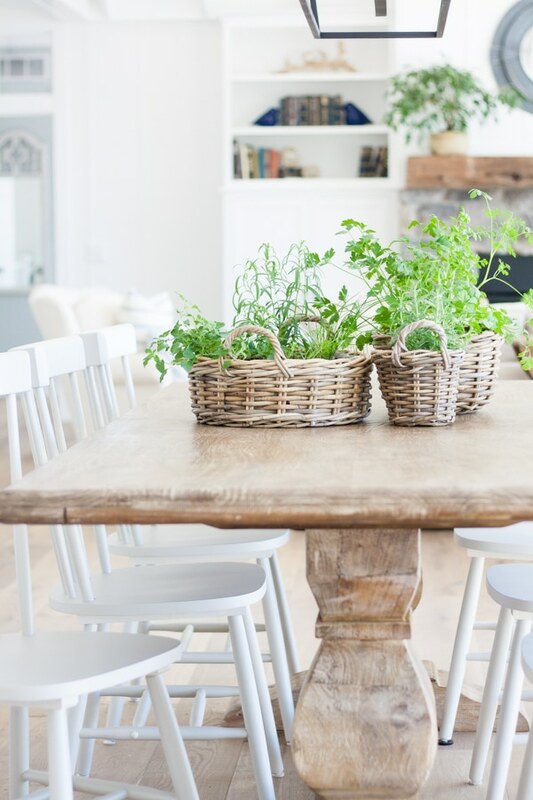 I love planting herbs in them because they are lightweight, look pretty and it’s easy to grab them to bring to the kitchen and snip what I need. They have a plastic liner in them to prevent water damage to the table. I also love the way the black lights set everything off, they sort of ground all the white. Stay tuned for more room reveals in the next few weeks! Sorry about the color confusion I edited the post above with the color, our color is Robin. It looks a bit more yellow on BuildDirect’s site but it isn’t yellow in person. The Dover is pretty too (one of the free samples I ordered in the mail) but it was a bit too gray for me. Congrats Kelly! Everything looks. Beautiful. My vote for the dining chairs is 2 different ones for the ends. Just sayin’ ;-) thx for sharing the journey with us! I’m kind of leaning that way too, I just haven’t found any that I love yet, well that aren’t a million dollars ha! Sorry about the color is actually Robin, we did get the dover sample too but it was a bit too gray for me. Definitely take advantage of the free samples from BuildDirect so you can check out all the colors! Looks beautiful! Looking forward to watching it all evolve over time. Thanks Maggie, thanks for following along. 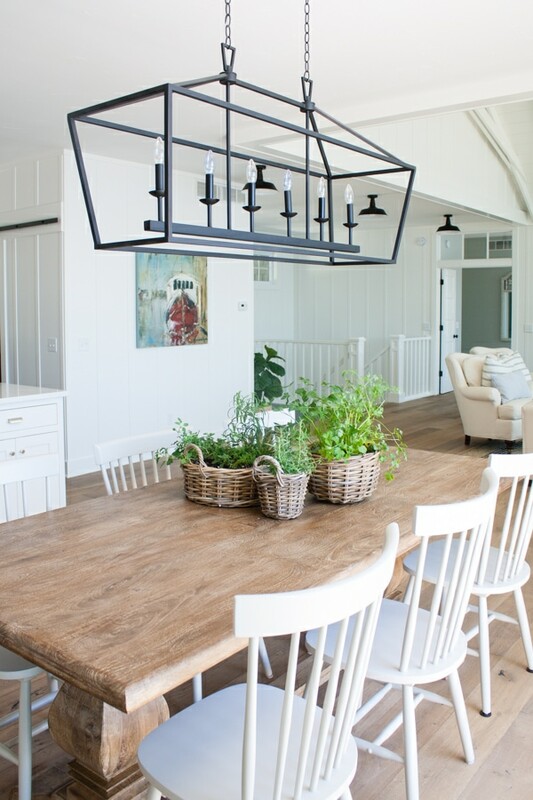 That light fixture is stunning and everything looks beyond gorgeous. I can’t wait to see your home decor evolving over time … I know it is going to be equally fabulous and am looking forward to following along! Thanks Helen, I was able to get a few different spaces shot this week so it should be easy to get a few posts together! But yes I will definitely be enjoying the summer with my family. Good to know…when we get closer to the time of replacement, I’ll definitely check it out. Congratulations on your beautiful new home! 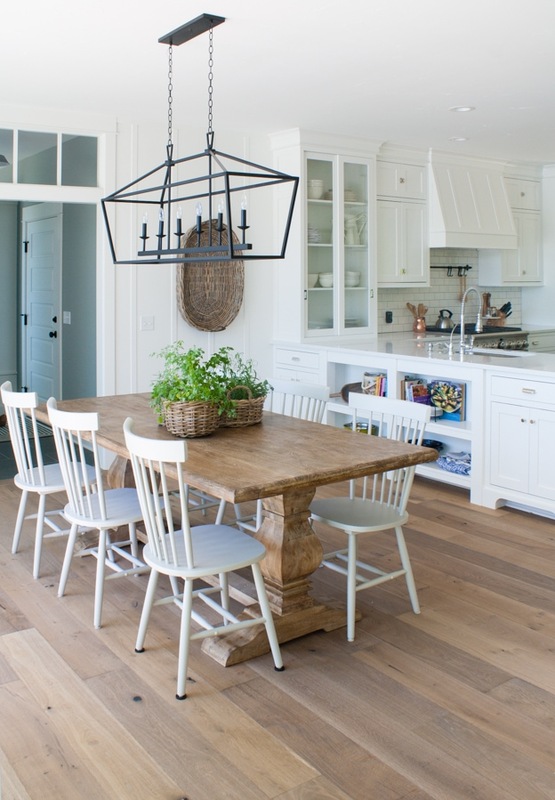 Perfection, just love the flooring and light fixture. Can’t wait to see it all. Many years of happy memories for your family. Oh my! What a beautiful house! I came here on Diane Hinkler’s suggestion on her site. I can see why she’s a fan. Love, love, love everything! The linear lines in the fifth picture down are AMAZING! And you already put up the boat pic up! I am not much for blogs – yours is the only one I actually read, and TRY to copy constantly. Enjoy the summer in your new home! Yes that was the first thing we put on the wall, love how it looks in this house! I have been following you forever but never comment. I just had to tell you that your choices are amazing and I can’t wait to see the other posts in the rest of the home. 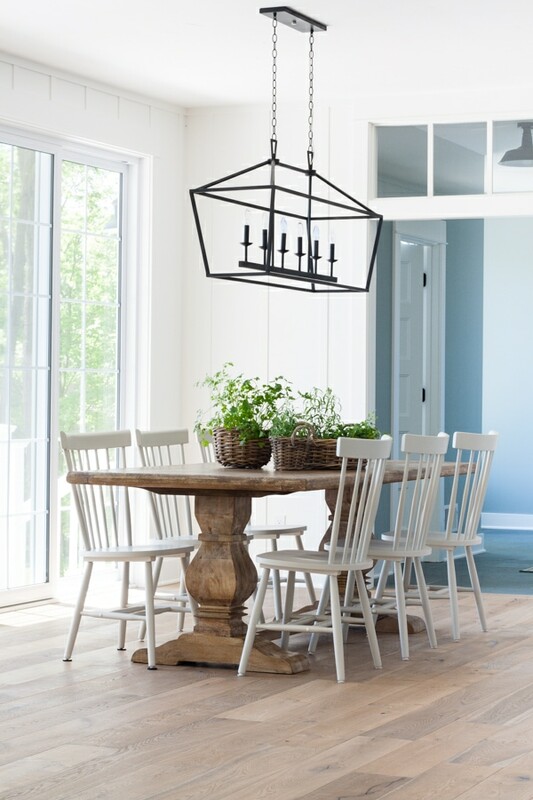 I have the Restoration Hardware table that is nearly identical to your dining table. Are your walls actually wood or is there just a vertical wood trim piece? Thanks for sharing! Hi Tricia, thanks for commenting! The walls aren’t actually wood just drywall and trim and then it’s all sprayed white to look like paneling. Kelly! Everything is so gorgeous! I love it all!! They are so pretty and they make the house smell amazing! Beautiful! I’m about to add board and batten to my kitchen walls and I was wondering if you used the same sheen on your walls as you did your trim, since it’s the same paint color. Our trim paint is high gloss, but I don’t think that would look good on the walls. Hi Laura on all the paneling we did satin paint but our trim is satin as well, I agree high gloss would be tough to keep looking nice on the walls. I have to admit I keep coming here every day hoping there will be a peek… and yay! Finally. And it is even more beautiful than I expected. You’re right. Those floors are everything. I really appreciate you sharing your home with and am thoroughly enjoying each post, inspired by your well thought out decor choices. So happy for you and your family…. HI Cindy thanks for being patient! I’m trying to get some more posts out (just put up a new one!) my kids are keeping me hopping now that they are out of school for summer. Just beautiful as always! Can’t wait to see the rest of the house. I love your style. Love the table and love your style. Absolutely beautiful. Your home is gorgeous! We share many of the same items! Can you tell me where you got what appears to be driftwood on the top shelf of your white bookcase? I think I picked it up at a flea market a few years back actually! Love every single detail! Beautiful! I’m trying to pick out a finish for our kitchen hardware. Any chance you could share what finish you used for your kitchen hardware? Polish nickel, chrome, satin…..etc! Thank you so much! I did Chrome hardware too, which I love and I’m hoping to share soon but I will say it’s not the best with my kiddos sticky fingers. I’m constantly wiping them down, but I don’t care because they are so pretty lol. Can’t be practical about everything ha! So beautiful and serene – love the flooring (had been thinking I’d want dark wood floors in my next house because you see them on so many design sites but I didn’t realize the increased upkeep associated with them!). I’m a big fan of gray tones and understated design and you have nailed the look! That way your accessories “pop” – like your baskets of herb plants – such a lovely touch! Can’t wait to tour all the rooms! Darker floors are so gorgeous and I love the contrast, but man they are a lot of work to keep looking nice! Beautiful. I love how bright and fresh it looks. Thanks Tanya, just what I was going for! Gorgeous flooring and a beautiful room! I have to admit that I was so so sad when you sold your home as gosh, I just loved it and everything about it. LOVE where your parents live, too. I sound like a stalker! And then I was not sure I could possibly wait to see what happened with your new home, but ta da! Here is our first inside glimpse and yes, I LOVE THIS ONE, TOO! Thanks for sharing with us along the way and now….hello….more rooms, please! hi Patty, I know lots of people thought we were nuts lol! Glad you approve so far, sharing more soon! It looks simply amazing! It’s such a pleasure to see your furnishings and looking forward to seeing more! Everything is looking gorgeous- love your style! Just gorgeous!!! Love everything! How did you ever choose the floors? They are beautiful! I don’t even know how to start the process….there are so many! Any tips? Thanks! Many many hours on the computer looking at all the options ha, really though the free samples really helped me narrow things down. 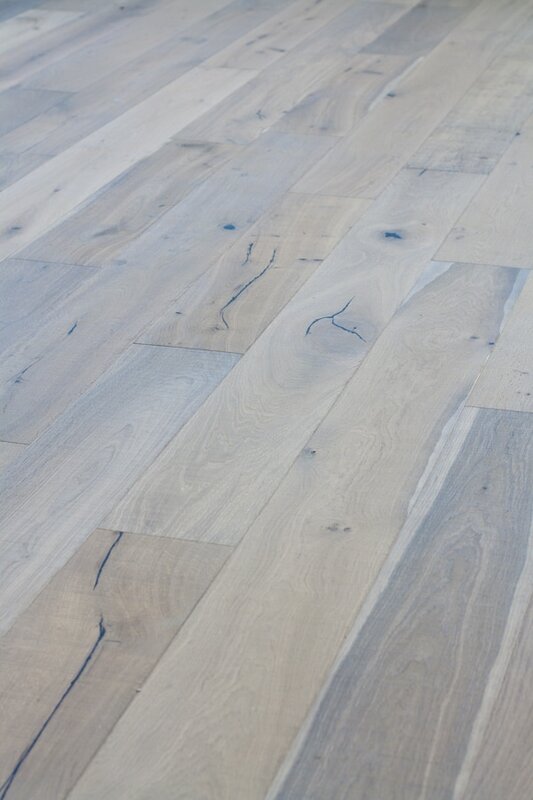 Every time I found a floor I liked I put the sample in my cart and then I went through my cart comparing them all and narrowed it down to the ones I wanted to see in person. Hope that helps! Thanks for the idea to use Build Direct, we are renovating and I have found some great buys on their site already. Your home is beautiful! Excited to see more. PS – I used to love seeing your recipe posts, any thoughts on bringing those back? Oh good, I’m glad you are loving their site as much as I do! I’m hoping to incorporate recipes back in this fall, when my kids are back in school – thanks! Gorgeous! I have dining room table envy. Thanks Becky, this table was such a great find. YAY! So glad to start seeing furniture inside. Love the floors and THAT TABLE IS EXACTLY What I was looking for 4 years ago. I wound up with one darker and every day it bugs me. I saw Pier 1 Imports has a new table that comes in 3 sizes that is very similar to this one. LOVE THE FLOOR. I laughed when I read that you may or may not have hugged your floor. Isnt that what a home should be? Filled with things that make us happy? You are my little sister I never had. We have such similar taste. Cant wait to see each room evolve. I love that you are taking your time. Thats the BEST WAY to do it! and much more FUN! Do you go to Flea Markets or antique shows? I just added a rusty chippy Coca Cola sign and i feel like it made my house complete. ENJOY! Ill stay tuned to every new post! Thanks Dixie! I do go to a flea market in the summer a lot with my mom or a friend and it is definitely one of my favorite things to do! Sharing more soon! So beautiful Kelly! We are thinking about building, please design for us! Swooning! I could move right in. I know this is a loaded question but how did you choose the white wall colour with all of the options out there?! Does it have a specific undertone to it? We want to go all white as well. I love everything you have done so far! 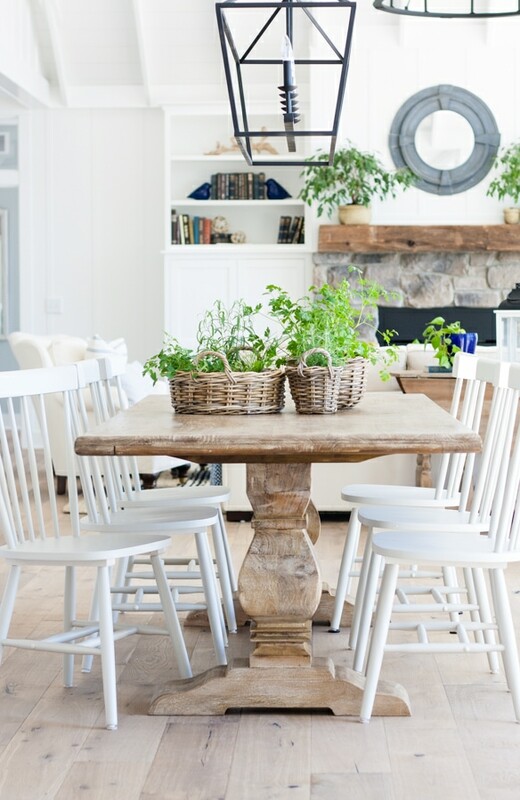 I look forward to new posts and checked everyday ;) I especially love the basket planters on the dining room table. They herbs add just enough color. Do you remember where you found them? Thanks! Beautiful home! Could you tell me where you found the baskets for your herbs? And what kind of plants are on your mantle? They were just from a local store, and the plants are Ficus. 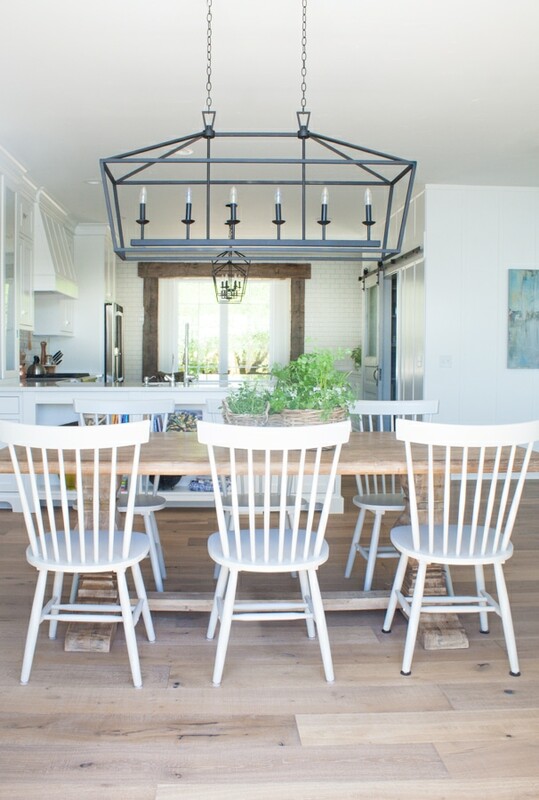 How are you liking the chairs from wayfair now that it’s been a few months?! I have my eye on them but tend to hone in on the negative reviews so I would love to hear your opinion on assembly and quality!!! I like them a lot still, I will say we mostly have been eating outside so we haven’t used them a ton but I think they are comfy. Hello! Really beautiful room! I just came across your site while searching for floors. I’m wondering how yours has been holding up? It looks like an oiled floor, which I’m hesitant about. Any problems with wear and tear, spills, things like that? Thank you! Hi, also wondering how your floors are holding up? Scratches, stains, dents? Hi Jill, no scratches, but we do have a small stain from a red popsicle (thanks to my daughter lol)! Because they have more of a raw finish we have to be careful to wipe up liquids quickly because they tend to absorb. My daughter left the popsicle drips for 2 days before I noticed them so they didn’t come completely out. I’m pretty sure I’m the only one who notices them though. I’m thinking of ordering that table from Art Van. It doesn’t have reviews, so I was wondering if you can tell me if you’re still happy with your choice. I felt like the Pier 1 one felt kind of fake. Is this one smooth on top? It sure looks nice in photos!! Hi Debi, yes I absolutely love it! It has some texture on top but not too much, doesn’t feel fake to me and I get lots of compliments on it. Absolutely beautiful! 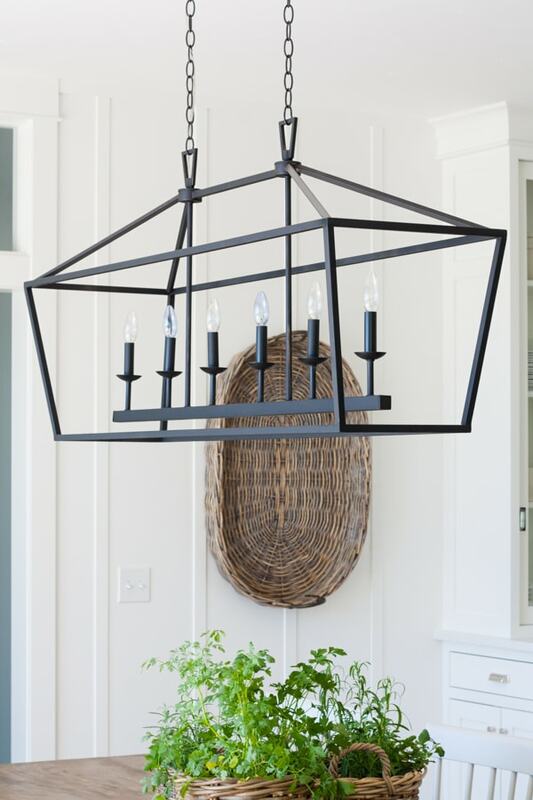 I’ve got that chandelier in my cart but I’m hesitating as it says the finish is rubbed oil bronze and I really need black. Would you say yours is more bronze or black? I actually bought the black and chrome version and spray painted the chrome part. Not sure if they even carry that version anymore? It was super easy to spray paint with matte black spray paint and that was the least expensive option I could find in black. 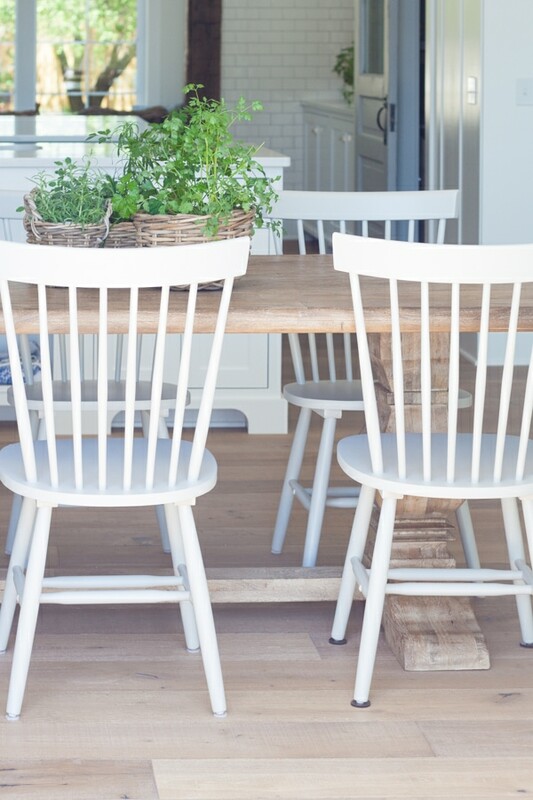 Are your chairs the off white or white? They are actually grey! The slipcovered ones are pretty white. Hi Kendall, we still love them. They are finicky when it comes to liquid getting on them. You need to wipe up any spills right away! The only place we have had issues is in our kitchen with a few stains. Watch my saved Instagram stories there is one labeled wood floors with lots of helpful info.